Buying a business Bluetooth headset for travel and desktop use sounds to be a simple task but it is actually not easy. I say that because not all of those headsets are designed to perfectly fit to your ears, you will need to really try them out to pick the most comfortable one. Moreover, we also care about design, sound quality and extra features. Here are some points that you need to consider when buying a Bluetooth headset. Call quality is the most important feature in a headset as everyone desires for a full, clear and crisp sound. 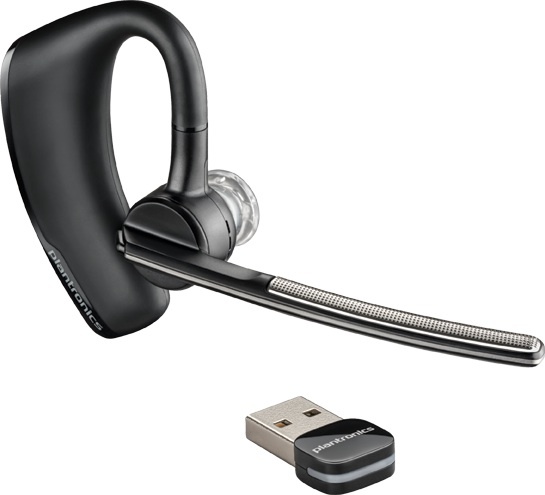 For the best performance, you can use a Plantronics phone headset. Larger headsets often have longer battery life. Be careful when picking a Bluetooth headset because some could last just over 2 hours while some could last up to 10 hours. You will want to get a headset that could sit stably on your ear. Some headsets come with rubber earbud so that it could fit better without being too tight. Some others can sit on the edge or use ear hook to stay comfortably on your ear. There are a lot of choices in style for your choice. This is personal choice, you also can choose between mono and stereo headset. The mono headset is more widely used because it is more compact and fit on a single ear. However, if you listen to music and want better sound quality, stereo headset is absolutely better. Noise Cancellation is an important feature of a business headset. You will want to hear the sound clearly when you are in a car, in a crowd or in a middle of a noisy environment. Headsets like the Plantronics Voyager Legend is a good choice as it can block the ambient noise quite well and also preserve quality of your voice. Some other features you might be interested are app platform, wire-free audio on PC or Mac, reading text messages, etc. Most of the business headsets are quite more affordable nowaday. You can get a really good one for less than $150 and some are even below $50. Which headset will you get for your daily use? Share with us in a comment below. I recently launches my own law firm. One of the first tasks was setting up phone lines. I chose to use Skype but now I need a good headset since my “phone” is really my computer. Thanks for giving me some guidance on choosing a headset.